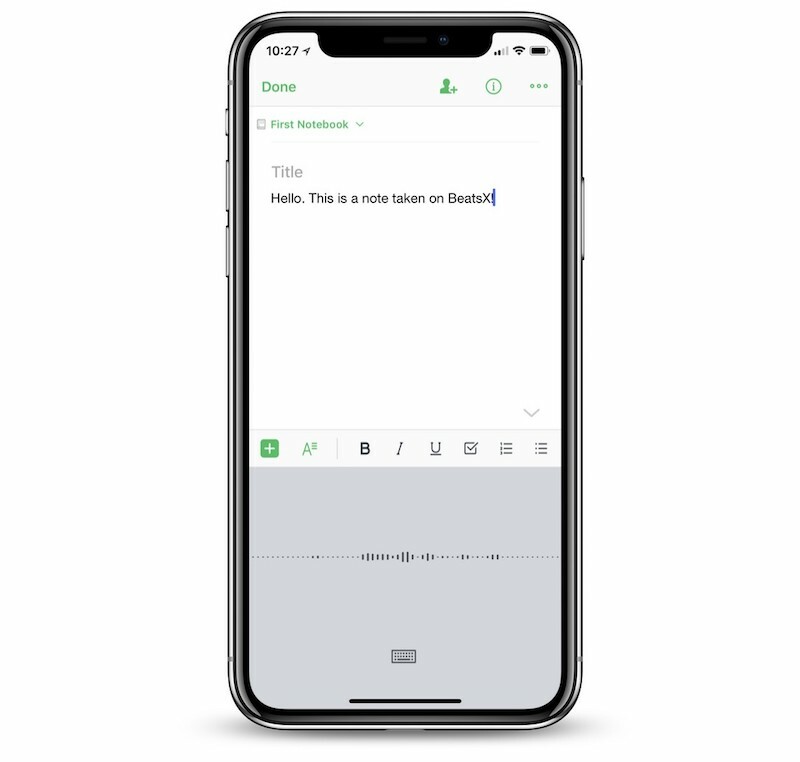 Note-taking app Evernote was updated over the weekend with a new feature that allows you to connect your Bluetooth headphones to the app and use them to record audio and transcribe voice-to-text notes. The company says that as long as the headphones have a microphone they will work, so if you own AirPods or BeatsX you'll be able to use the wireless earphones to quickly jot down notes and reminders using your voice and Evernote. To use the feature, make sure your Bluetooth headphones are on and connected to the iPhone, which you can double check in the Settings app > Bluetooth. Next open Evernote, tap the large "+" button at the bottom of the screen to create a new note, then tap the microphone icon at the bottom right of the keyboard on iOS. As long as your headphones are connected, Evernote will now route audio from the headphone's microphone instead of the iPhone, so you can transcribe notes or save audio files without needing to hold your iPhone up to your mouth. If your bluetooth headphones also have a microphone (*cough* Apple AirPods *cough*), you'll be happy to know you can now use them to record audio into Evernote. The version 8.12 update also brings a tweak to the note list view so you can better keep track of where you are in your notes, with month and year designators staying pinned at the top of the screen as you browse. The company also cleaned up the sharing menu, brought back the Context feature for Premium and Business users, and fixed a handful of bugs. Evernote previously debuted full "Hey Siri" support last September, allowing iPhone owners to use phrases like "Hey Siri, add 'I should bring pizza' to my Meeting Ideas note in Evernote." The app has long supported voice notes and transcribing features on iOS with the iPhone and iPad's built in microphones, but the new addition of Bluetooth headphone support should make note-taking easier for many users. Evernote is free to download on the iOS App Store [Direct Link], while Evernote Premium runs for $7.99 monthly, or $69.99 annually, and comes with more monthly storage space, unlimited devices, and more. Let me take handwritten notes with my Apple Pencil on my iPad within the app without having to use a different app in addition to Evernote. This is my ONLY request. It is the ONLY reason I struggle every year when it's time to pay another $70 to use the service. I still do it, but this is literally the only thing that makes me still want to find a way to switch to OneNote over Evernote. I quitted Evernote because of their payment plans..I used to be a big fan of the productivity app! Same... I found out Notes and Notion is good for my use after I ditched Evernote. I use Evernote (free) and have used Apple Pencil on my iPad Pro to take handwritten notes since the Pencil/iPad Pro launched. Start a new note, and then click the little pen-squiggly-line icon at the bottom. Is there something else you are trying to accomplish that I'm missing?